Recently while I was procrastinating about work & taking refuge in Facebook, a friend happened to mention a new book that she found fascinating & incredibly moving...and I did too. 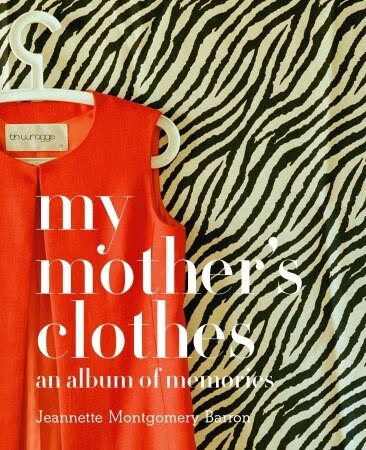 'My Mother's Clothes: An Album of Memories' lovingly written & compiled by Jeannette Montgomery Barron (published by Welcome Books) is a treasure trove of prized clothing, shoes and accessories -- the wardrobe of a lifetime, all belonging to Montgomery Barron's dear Mother, Eleanor. The project began as a way for Montgomery Barron to share her Mother's memories, recollections that were fading as her Mom's ability to remember began to fail. Each piece of clothing sparked a story, a feeling, a timeless account -- and as her photographs captured for posterity her Mother's fashions, Montgomery Barron discovered more & more intriguing anecdotes about her Mother's life. In time, Eleanor's memory loss slipped fully into Alzheimer's, a disease that claimed her life in 2007. With the love that only a daughter can offer, Montgomery Barron continued her project to honour her beloved Mother, and today her incredible book allows the rest of the world to meet the amazing woman ~ Eleanor Morgan Montgomery Atuk ~ who was her Mother. The book is a wonderful memoir, a gorgeous tribute to someone so loved. I heartily recommend it - even though I find that I cannot crack it open without a box of tissues close by. 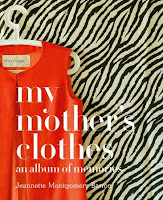 I located my copy at Anthropologie but "My Mother's Clothes" can be purchased from most booksellers, and online as well. Love this - sad and happy all at one time. It's a fantastic book on so many levels.